White Wave Chapel works as an organic, honest release from Irish folk act I Draw Slow. Populated by the group’s pin-point performances and beautiful arrangements. With the opening, sudden harmonic burst found on ‘All Souls’ I Draw Slow’s deep sense of melodic structure and musicianship is translated from the outset. Undulating passages of melody and interwoven instrumentation blend together to form the vibrant sonic tapestry on which the album finds its centre. Introducing a sense of aspect and tone to White Wave Chapel, ballads such as ‘Souvenirs’ give the L.P room to breath. 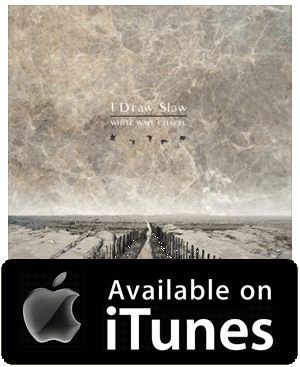 Taking in the gentle ambience of I Draw Slow’s music the softly performed harmonies create a subtle atmosphere to the reverberated backdrop of the recording, as the vocal quietly echoes and recedes. Dynamically diverse, I Draw Slow capture a wide-range of musical influences while maintaining a palpable sonic thread throughout White Wave Chapel. The up-tempo stomp of ‘Oh My Honey’ frantically powers through and highlights the band’s bluegrass leanings while ‘Grand Hotel’ introduces a more alternative-country edge to the record. However, it is with the stunning, all-encompassing beauty of lead single ‘Valentine’ that the high water mark of White Wave Chapel is made. From the opening reverb soaked vocal of the first verse to the introduction of the full band with an abrupt crash of bass, strings and percussion the full spectrum of I Draw Slow’s sound is felt with each melody, each beat and each chord resonating in tune with the song’s astounding aesthetic. Above this sits Louise Holden’s heartbreaking vocal delivery, honest, relatable and perfectly performed Holden adds the extra element that makes the song so believable. An album in the true sense of the term, White Wave Chapel has to be experienced as a piece from beginning to end. Contextually, I Draw Slow never seek to reinvent the wheel with this record, but instead look to create an L.P that tells a story both musically and lyrically and in this way the group excel with an album filled with sonic and emotional beauty.